Former Prime Minister Arseniy Yatsenyuk on Monday, December 11, testified in Kyiv's Obolon District Court in the case of high treason of former President Viktor Yanukovych. Yatsenyuk said he met with Yanukovych in 2002, when he was acting head of the National Bank and Yanukovych a prime minister. The last conversation between them took place on 22 February, 2014 by phone. In his testimony, the former prime minister described the relations with Yanukovych and the leadership of the Russian Federation, recalling, in particular, the Kharkiv agreements. "Under the Kharkiv [Ukraine-Russia] agreements, Viktor Yanukovych conseeded to extend the unconstitutional stay of foreign troops, namely the RF Black Sea Fleet, in the territory of Ukraine until 2042, which, among other things, led to the illegal annexation of the Ukrainian territory," he said. Yatsenyuk also recalled that Ukraine's defence minister, central bank governor, chief of presidential personal guard, and other top officials were Russian citizens under Yanukovych. The former prime minister said that between 2010 and 2014 about 50 bilateral agreements have been concluded between Ukraine and Russia. "Largely, these documents were aimed to strengthen Russia's grip on Ukraine," said Yatsenyuk. He also said that under the pressure of the Russian Federation, Yanukovych refused to comply with the law that obliged him to sign the Association Agreement with the European Union. "This [Yanukovych's] move was lauded by Russia's Foreign Ministry and the Russian regime as a whole. Viktor Yanukovych was entirely dependent on the Russian Federation and personally on President Putin," Yatseniuk said. 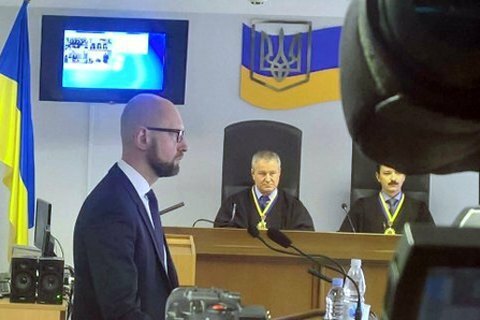 At the request of the prosecution, Yatseniuk also spoke out on the circumstances around of the assignment of presidential duties onto the then Rada speaker Oleksandr Turchynov after Yanukovych's flee to Russia, The politician said he did not believe Yanukovych's life was in danger in Ukraine at that time.